For some Dell computers, old, actually not that old, such as Dell Studio 15xx laptop, released around 5 years ago, some of them only were recommended to install Windows XP and Windows Vista, not recommended to install Windows 7, like Dell Studio 1535. However, Dell Studio 1535 still can run Windows 7 well, maybe there is only very few hardware can not work in Windows 7 system, but for us, we never found anything could not work after we installed Windows 7, at least for our daily works, the Windows 7 on Dell Studio 1535 is OK, no problem. But there is a problem: Seems Dell themselves do not believe their part of old model computers can work in Windows 7 system without big issue, they even do not provide any official software, tools, drivers for Windows 7. for example, we wanted to update the BIOS which Dell provided. 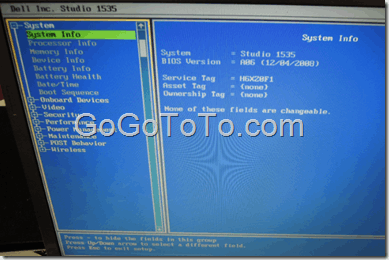 but, they updated BIOS program could NOT run if we have Windows 7 system installed, the error information most were indicating ROM Image file not valid. The reason is just their new BIOS program can not run in Windows 7. So, in this case, we have to find other way to update Dell computer BIOS – Using elder boot system to boot our computer. What we did was that making a bootable USB driver which include elder system, such as DOS with Windows support, we used Windows 98 DOS. Follow this page which was from Seven Forums. Followed the steps from that page, and we could get a bootable USB driver. After we get bootable USB, we copied the new Dell BIOS version to the USB driver. Then plugin this USB driver on our Dell laptop, to boot. but please change your computer’s boot order in your BIOS setup, which the USB boot should be the first. We saw the USB boot very fast, since it is a DOS boot actually. followed steps and saw the new BIOS version installed successfully.